An Italian invasion is under way. This week has seen the opening of wine bar and deli Enoteca Rabezzana in Smithfield, brought about by the chef behind High Street Kensington Italian Acciuga. Luppolo launches today in Wanstead, serving cured meats and cheeses from Italy alongside produce-topped pizzas and craft beers, including a bespoke pale ale made just for them by Hackney Brewery. In February, Italian deli and eatery Pulia opens on Stoney Street near Borough Market. It will be the first branch outside of Italy, following outlets in Florence, Milan, Turin and Venice. As the name hints, it will specialise in produce from Puglia, majoring in olives, oils, cheeses, pastas and pizzas. It will also serve rustici (savoury pastries), crocche di patate (potato fritters) and pasticciotto (custard pies). The following month sees deli, wine bar and restaurant Il Cudega arrive under railway arches in London Fields, dedicated to the food of Lombardy. Bellissimo. Ramen has become a big deal in London, with restaurants dedicated to the Japanese noodle soup popping up across town — most recently with the simultaneous opening of Japanese chains Ippudo and Kanada-Ya right opposite each other. But is udon about to usurp ramen as king of the noodle? It’s winning favour in Japan for its lighter and low-fat properties, and Soho udon bar Koya is already considered one of the capital’s best Japanese restaurants. 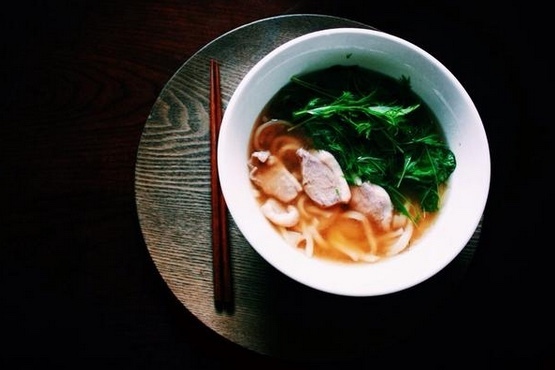 Next week sees udon-focussed Den open in King’s Cross, with former Koya and Bone Daddies chef Emi Machida at the helm. It will serve homemade udon noodles in three stocks: white dashi, dark dashi (both made with fish and seaweed, the latter with added soy), and a vegetarian option. When the Cocktail Trading Company Development Bar & Table opens in January, it could well take the title of London’s longest bar name. It will also likely become a hangout for cocktail geeks, aficionados and industry folk. It’s being opened by Andy Mil, Elliot Ball, and Olly Brading, who have experience in bars across town, including at Steam & Rye and London Cocktail Club. In March the trio formed the Cocktail Trading Company together, and this is their first venture. Expect quirky and experimental serves, as well as a large range of non-alcoholic ‘faux cocktails’. It will replace the &Co bar on Great Marlborough Street, under Central & Co.
10 years after Spanish food giant Brindisa opened its first restaurant at Borough Market, it has announced it will soon open its sixth eatery. The tapas bar launches in February on Rupert Street, joining a nearby restaurant on Broadwick Street. There are also branches in Brixton, Shoreditch and South Kensington. Middle Eastern pop-up Ceru has launched in Fitzrovia, serving small plates inspired by the food of Cyprus, Israel, Lebanon and Turkey. It made a name for itself on the coast when doing a stint in Brighton, and will stick around on Rathbone Place for five months. London has also gained grill restaurant Kitty Fishers in Mayfair, tapas restaurant Copita Del Mercado in Spitalfields, Fraq’s Lobster Shack on Goodge Street, and casual restaurant The Green Room at the National Theatre. Yesterday saw Cereal Killer Café open on Brick Lane, serving breakfast cereal throughout the day. Next week sees Bad Egg open near Moorgate, serving burgers, ribs and lots of egg dishes. The man in charge is Neil Rankin, who also heads up Islington’s meaty Smokehouse. Announced for early next year is West End Japanese restaurant Murakami, which will serve sushi, sashimi, cocktails and Japanese whisky; second branches of both Shake Shack (in Westfield Stratford) and Boom Burger (in Brixton); and interesting new Middle Eastern grill concept Berber & Q in Haggerston. The Fourteenth Colonie — an outpost of New York restaurant Colonie — will open in Clerkenwell, while Soho will gain more hotdogs with the launch of Top Dog, which will serve organic hotdogs, fries and shakes.